Boreal woodland caribou (‘caribou’1Although there are several types of caribou in Canada, throughout this Backgrounder ‘caribou’ refers specifically to boreal woodland caribou, Rangifer tarandus caribou (Forest dwelling boreal population)) live across northern Canada and need large, intact forests to survive. The ultimate cause of caribou decline across the country is habitat loss and fragmentation from extensive industrial resource extraction activities. Extensive habitat disturbance in turn increases predation rates for caribou beyond what they can tolerate. To date, these caribou have lost more than half of their historic range in the continent.2Hummell, Monte, and Ray, Justina, Caribou and the North: A Shared Future, Dundurn Press, Toronto, 2008, p.229. In 2012, the federal Recovery Strategy identified that 37 of 51 populations are not self-sustaining.3Environment Canada. 2012. Recovery Strategy for the Woodland Caribou (Rangifer tarandus caribou), Boreal population, in Canada. Species at Risk Act Recovery Strategy Series. Environment Canada, Ottawa.Caribou are a cornerstone of many Indigenous Peoples’ culture and history; for thousands of years Indigenous Peoples from across Canada have relied and continue to rely on caribou for sustenance and as a central part of their culture. Under the federal Species At Risk Act (SARA), the federal government is mandated to identify caribou critical habitat – the habitat that caribou need to survive and recover – in a Recovery Strategy. It did so in 2012. A team of North America’s leading caribou experts established a strong relationship between the extent of habitat disturbance and whether a local population increases, declines or remains stable. From this, the federal government assessed how levels of habitat disturbance affect risk to caribou populations. It directed provinces to manage forests such that there is at least 65% undisturbed habitat in each caribou range, to give caribou at least a 60% chance to be self-sustaining. Across Canada, provinces have failed to apply this science in effective caribou management strategies. As a result, disturbance levels continue to increase, and caribou in many ranges continue to decline. Below are three examples of ranges where increasing industrial activity since the Recovery Strategy’s release continues to undermine caribou survival and recovery. 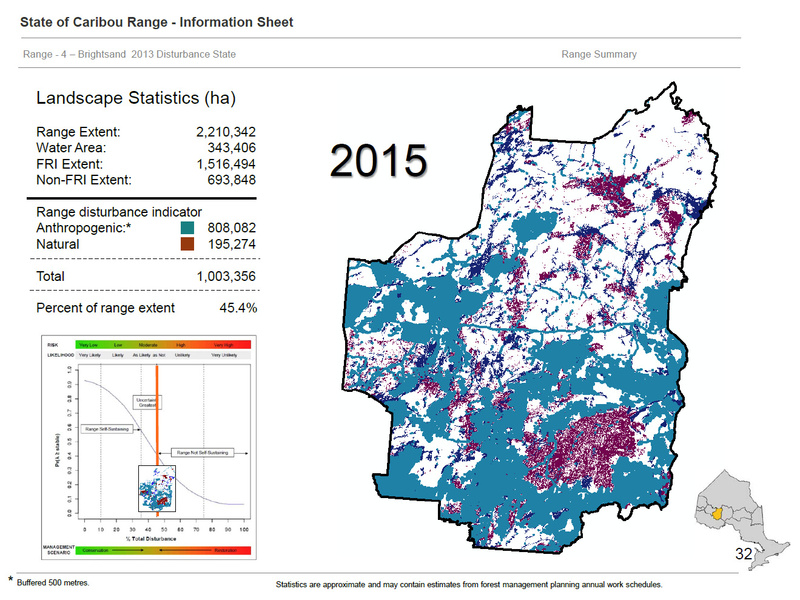 By using the slider on the interactive maps below to slide back and forth, you will see forest fragmentation in 2012 when the Recovery Strategy came out, and how it looked in 2016, four years later. We have selected “hot spots” in each range, where you can see how forestry and other developments continue to expand in caribou ranges. Use the overview maps on the right to select different hotspots to look at. You can also use the check boxes on the bottom left to highlight specific types of additional development. Projection: Canada Albers Equal Area Conic. Mapping prepared 2017-10-27, cartographer: S. Nichols. For technical details and information on the methodology used to produce these maps, please contact Carolyn Campbell at ccampbell@abwild.ca. Alberta is one of Canada’s few provinces without a specific law to protect its species at risk. Alberta’s archaic Wildlife Act focuses on managing hunting rather than the importance of securing wildlife habitat. Recent caribou management decisions include both positive and negative elements, but overall, new forestry and energy sector surface disturbance continues to destroy caribou critical habitat within many of the province’s already excessively disturbed ranges. A long-term commitment to habitat maintenance and recovery must replace reliance on band-aid wildlife management measures, such as predator culls. Alberta has monitored female mortality and calf survival in all its caribou populations. In 2013, the peer-reviewed scientific conclusions from this population research showed caribou were declining rapidly across Alberta, with a decline of approximately 50% every 8 years. On the positive side, Alberta has paused new energy lease auctions within caribou ranges since summer 2015. It has also allowed existing lease holders to voluntarily delay drilling in ranges until early 2019. A government-appointed mediator conducted inclusive consultations on west central ranges in early 2016. In June 2016, Alberta made a high profile commitment to establish significant new protected areas in three northwest caribou ranges; these would be in portions of the range that have no existing industrial forestry tenure. However, there are no timelines to stop new disturbance or achieve the minimum intact habitat levels to recover caribou. Alberta’s only draft caribou range plan is for the Little Smoky and A La Peche ranges in west central Alberta: it proposes more short-term logging (albeit less than ‘business as usual’), unspecified new oil and gas-related surface disturbance, and is silent on long-term logging. This ongoing habitat loss will lengthen reliance on the regrettable 10 year old massive wolf kill in that region. The draft plan also proposes to confine wild caribou females within a large fenced compound, and then release their yearlings into worsening habitat. A positive element of the draft range plan is an extensive seismic line restoration program, funded largely by the energy industry. Chinchaga Range Profile – Situated on Alberta’s northwest border adjacent to BC, the Chinchaga caribou range was assessed as having 76% habitat disturbance in 2011. It has one of the lowest estimated calf survival rates in Alberta. Since the 2012 federal caribou Recovery Strategy, the Alberta government auctioned 1000 km2 of new energy leases in this range before halting lease sales in August 2015. One Wildland Park covers 5% of this caribou range; otherwise there are no limits to industrial disturbance. In June 2016, the Alberta government promised to extend the existing Wildland Park by 3500 km2 into an adjacent area that has no industrial forestry, to increase protected areas to 24% of this range; however, there have been few follow-up actions to date. Significant energy extraction from greatly reduced surface footprint, with longer distance directional drilling, pooled leases and shared infrastructure. Substantial jobs from extensive forest habitat restoration programs across and adjacent to ranges. Reformed regional timber supply allocation and management, to support sustainable forestry that is compatible with recovery of caribou and other sentinel wildlife species. Quebec’s woodland caribou recovery team was formed in 2003 and is comprised of scientific experts, government and industry representatives, outfitters, First Nations and environmental NGOs. In May 2013, the team produced its second 10-year woodland caribou recovery plan (2013-2023). Despite acknowledging receipt of the plan, the government indicated it would not adopt it due to potential socio-economic impacts. In April 2016, Quebec announced it had a “credible, acceptable and reasonable” action plan for woodland caribou habitat conservation. That plan is currently in development and expected to be released in 2018. Quebec has come under fire in recent months due to a highly controversial announcement that the isolated Val d’Or population (~18 individuals) would be translocated to a zoo in St-Félicien. Furthermore, it was revealed that construction of a new road had been approved through one of the population’s last refuge areas against the recommendation of government scientists. Opposition to the government’s announcement was so fervent that the St-Félicien zoo finally retracted. However, construction of the road in question is still underway. Overall, Quebec’s announcement sets a dangerous precedent suggesting it is an acceptable solution to relocate threatened caribou and thereby ignore the underlying sustainability issue. 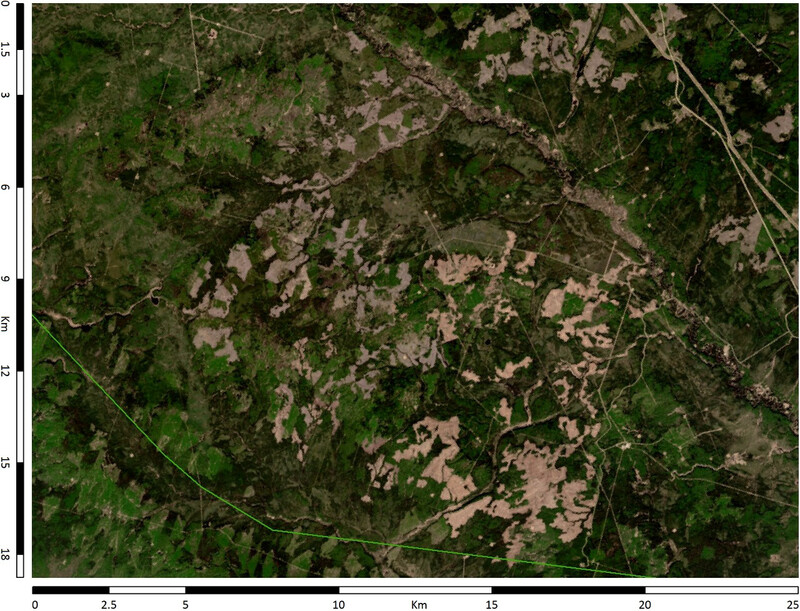 Industrial forest management is the primary driver of caribou critical habitat deterioration in Quebec. Additional disturbances include mining, hydroelectric development and recreational tourism. The majority of Quebec’s commercial forest is excessively disturbed and considered unlikely to support self-sustaining caribou populations. Current modeling projections indicate that in many cases, sufficient habitat recovery is unlikely to occur over the next 100 years. The areas most likely to support self-sustaining caribou populations at present include the Broadback river valley, the White Mountains, and the remote North and Lower North Shore regions. Although cumulative disturbances continue to further erode caribou critical habitat in Quebec, certain places have benefited from interim protection. Negotiations continue towards designating at least one new protected area in the White Mountains. A relatively small portion of the Broadback river valley was granted permanent protection in 2015, although roughly half of it is situated outside the commercial forest. The Quebec government is currently designing a network of ‘suitable vast areas’ for caribou, within which mitigation measures yet to be disclosed will be implemented. These are likely to involve special management of intact residual forests presently slated for future logging. In terms of other concrete measures, Quebec is investing $7 million over the next 3 years toward population delineation and monitoring, although this also includes migratory and mountain caribou of Quebec. Work has also begun on a pilot study area in the North Shore region where road restoration practices will be tested. Lastly, four technical committees have been formed to develop the governmental action plan as it pertains to habitat management, socioeconomic impacts, population monitoring and population protection. Quebec’s action plan for woodland caribou is eagerly awaited, and a significant step forward is needed if it is to meet the requirements of the federal recovery strategy. Pipmuacan Range Profile – The Pipmuacan caribou range overlaps the Saguenay-Lac-St-Jean (western portion) and North Shore (eastern portion) regions of Quebec4Management units 02452 and 09751 near the Pipmuacan hydroelectric reservoir. It is one of the southernmost ranges found within the semi-continuous caribou distribution zone and therefore among the most disturbed. Several hundred kilometres of new roads have been built on the Pipmuacan range since the federal Recovery Strategy was released, and several hundred square kilometres of caribou critical habitat have been logged. In 2013, range disturbance within the two forest management units encompassing the Pipmuacan range was estimated to be roughly 74%,5Ministère des Forêts, de la Faune et des Parcs du Québec (2015). Rapport d’analyse sur l’intégration des Lignes directrices pour l’aménagement de l’habitat du caribou forestier (2013) dans la planification territoriale. Rapport du Groupe de travail interministériel sur l’intégration des Lignes directrices pour l’aménagement de l’habitat du caribou forestier (2013) dans la planification territoriale. Gouvernement du Québec, 42 pp. + 1 annexe. most of which is attributed to the permanent road network. Less than 1% of this area is protected, and even the most optimistic scenario indicates that cumulative disturbance rates will remain over 45% in the long term (100 years).6Ministère des Forêts, de la Faune et des Parcs du Québec (2015). 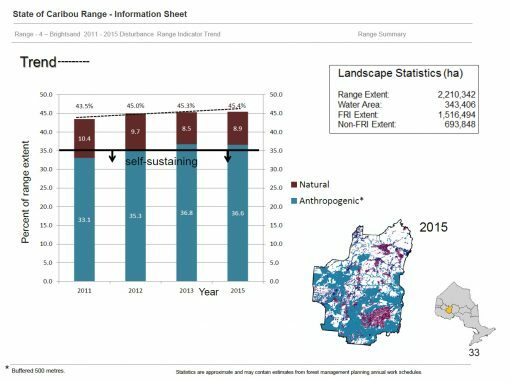 Rapport d’analyse sur l’intégration des Lignes directrices pour l’aménagement de l’habitat du caribou forestier (2013) dans la planification territoriale. Rapport du Groupe de travail interministériel sur l’intégration des Lignes directrices pour l’aménagement de l’habitat du caribou forestier (2013) dans la planification territoriale. Gouvernement du Québec, 42 pp. + 1 annexe. 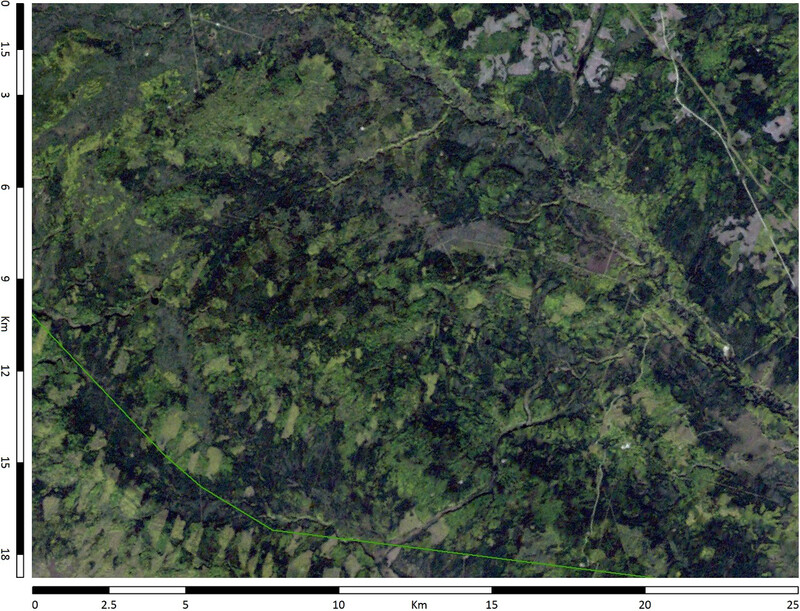 Landscape mapping combined with aerial surveys conducted by government biologists in 2007 and then in 2012 suggest that caribou may have gradually concentrated near the Pipmuacan reservoir as a result of extensive logging in the surrounding areas. Recent data indicates that calf recruitment is insufficient to compensate for adult mortality, and supports the conclusion that caribou of the Pipmuacan range are declining.7Dussault, C. (2013). Inventaire du caribou forestier à l’hiver 2012 au Saguenay-Lac-Saint-Jean. Société de la faune et des parcs du Québec, Direction de l’aménagement de la faune du Saguenay–Lac-Saint-Jean. 20 pp. What is more, this decline is expected to continue well into the future without a substantial commitment by government to increase habitat protection. Recently, the Montreal Economic Institute reported that the conservation of woodland caribou in Quebec would cost the forest industry $740 million and 5700 jobs.8http://www.iedm.org/74547-boreal-caribou-preservation-plan-could-cost-over-740-million-year This sensationalist claim is based on superficial rules of thumb, not a rigorous and scientifically defensible economic study. In reality, changes in fibre sourcing and consumer demand have played a key role in the downsizing and increased automation of the forest industry in recent years, resulting in the loss of thousands of jobs in the forest sector. Under the circumstances, caribou have become a vulnerable scapegoat for forestry industry lobbyists. While conservation of caribou critical habitat may result in reduced wood supply, practical solutions exist and these must be embraced while there is still time. For example, government subsidies normally directed toward road construction and maintenance could instead be used to train and hire skilled workers for habitat restoration purposes. Furthermore, practicing intensive forestry close to mills could lessen logging pressure in more remote intact areas where boreal caribou are more likely to be concentrated due to existing habitat disturbance. Conducting forest management planning at the population range scale would facilitate this approach by increasing the area within which wood volumes could be sourced. For two decades, Ontario has had management policies in place that apply to boreal woodland caribou. As a listed threatened species9Species at Risk in Ontario List (O. Reg. 230/08) under Ontario’s Endangered Species Act (ESA), they require a provincial Recovery Strategy and government ‘response statement.’ In 2008, the Recovery Strategy for the Woodland Caribou in Ontario was finalized, and the government’s response statement, known as Ontario’s Woodland Caribou Conservation Plan (‘CCP’), was released in October 2009.10Province of Ontario. Ontario’s Woodland Caribou Conservation Plan. http://files.ontario.ca/environment-and-energy/species-at-risk/277783.pdf Its goals are “to maintain self-sustaining, genetically-connected local populations of Woodland Caribou (forest-dwelling boreal population) where they currently exist, improve security and connections among isolated mainland local populations, and facilitate the return of caribou to strategic areas near their current extent of occurrence.” The key innovation of the CCP was that it prescribed the adoption of a range management approach: caribou ranges would provide the geographic basis for evaluating habitat conditions, identifying caribou habitat, assessing population trends, and quantifying and addressing cumulative effects. Five years later (December 2014), Ontario published the “Range Management Policy in Support of Woodland Caribou and Recovery.” The first Principle of the Range Management Policy is that ranges will be managed such that “the amount of cumulative disturbance remains at or moves towards a level that supports a self-sustaining caribou population.”11Province of Ontario, December 2014. Range Management Policy in Support of Woodland Caribou Conservation and Recovery. https://dr6j45jk9xcmk.cloudfront.net/documents/3945/caribou-range-management-en-final-december-2014.pdfDespite the breadth of policy and management guidance developed in Ontario, cumulative disturbance, specifically anthropogenic disturbance, has continued to increase since the federal Recovery Strategy was published in 2012. In the seven caribou ranges that overlap with industrial logging, the estimated anthropogenic disturbance12Anthropogenic disturbance estimates include a 500 m buffer. was 6,975,000 ha in 2012, and rose to 7,178,400 ha in 201513Elkie and Green. 2016. Cumulative Impacts Monitoring 2016 Estimates, an increase of 200,000 ha. During the same period, natural disturbance increased by 13,000 ha.14In a previous analysis (Ontario Ministry of Natural Resources and Forests (MNRF), 2014), an overlap of approximately 2-3% of the range was found between anthropogenic and natural disturbance, which has been summarized in the anthropogenic statistics. Five of the seven caribou ranges that overlap with industrial logging are below the minimum 65% undisturbed threshold identified in the federal Recovery Strategy. Four populations are now considered at moderate-high risk, and unlikely to persist if conditions do not change. In addition, recent population surveys have indicated that most caribou are in decline in Ontario: some moderately, some significantly.15MNRF. 2014. Integrated Range Assessment for Woodland Caribou and their Habitat: Brightsand Range 2010. Species at Risk Branch, Thunder Bay, Ontario, xi + 74pp.Caribou recovery is further hampered by the fact that forestry activities associated with industrial logging have received a regulatory exemption from Ontario’s ESA. As a result, they are not subject to the recovery requirements defined under this law (i.e., “overall benefit”). This is despite the fact that disturbance associated with industrial logging and associated roads areis one of the key contributors to cumulative disturbance in Ontario’s managed forest. Instead, forest management direction is provided through the 1994 Crown Forest Sustainability Act (CFSA) which is designed to mitigate impacts of logging on wildlife habitat, not support the recovery of species at risk. Brightsand Range Profile Located just north of Thunder Bay, the Brightsand caribou range is considered “unlikely” to persist, based on cumulative disturbance which has now exceeded 45%.16Most recent data based on 2015 In the 3 years that Ontario undertook calf recruitment surveys (2011-2013), recruitment ranged from 18.2 to 25.5 calves per 100 cows. Environment Canada (2008) suggests that a level of 29.8 calves per 100 cows is needed to support a stable or increasing population. The most recent range report also stated that long-term trends suggest that range recession has occurred within the Brightsand range, as some previously occupied areas in the southern portion of the range are no longer occupied by caribou. As an average across the Brightsand range, young forests are within the amount expected under natural conditions, however, there is a significant variation in spatial distribution – the bulk of mature and old growth forests are located in the northern parts of the range, and the bulk of the younger forests are located in the southern parts of the range. Increasing disturbance trend in the Brightsand caribou range. Disturbance has continued to increase while the forest industry has had a regulatory exemption from Ontario’s Endangered Species Act; disturbance now exceeds 45%. In 2015, anthropogenic disturbance on the Brightsand range = 808,082 ha, and natural disturbance = 195,274 ha. Fact: Scientific research has yielded clear and consistent results across the country. The continuum of risk established by Environment Canada in 2008 has been refined by recent science, but no new science has served to refute it. – Environment Canada. 2012. Recovery Strategy for the Woodland Caribou (Rangifer tarandus caribou), Boreal population, in Canada. Species at Risk Act Recovery Strategy Series. Environment Canada, Ottawa. P. 34. Fact: Indigenous communities, other local communities and all citizens deserve meaningful consultation and information about managing the important lands that support caribou. Indigenous and local communities should participate in choosing the best socio-economic actions that guarantee caribou range requirements to protect caribou critical habitat. Planning range access with indigenous communities, industry, hunters and trappers that is compatible with caribou recovery is urgently needed. Recent studies have shown that the primary driver of job losses in Canada’s forestry sector is mechanization and the downturn in newsprint, not habitat conservation. Fact: Caribou habitat loss driven by excessive clearcut logging and energy surface disturbance has been documented for decades. Climate change adds to pressures on northern forest ecosystems, and only increases the reasons why we need better management. Caribou habitat recovery can help forests be more resilient to climate change, by reducing fragmentation and slowing down loss of older forests and wetlands. Fact: The root cause of increased caribou predation by wolves and other predators is fragmented and degraded habitat in caribou ranges. Cutblocks, roads, and poorly reclaimed seismic lines and well pads support increases in deer, moose and wolf populations, create more predator access to caribou and diminish caribou’s ability to avoid overlap with predators they’ve co-existed with for thousands of years. Fact: Caribou populations are declining almost everywhere that project-level operating guidelines are the main habitat management tool. Who is working to save caribou? Caribou across Canada are in crisis, with many herds facing extinction due to decades of neglect. The governments and resource companies responsible for their protection are not getting the job done, failing to set aside the habitat crucial to their survival and recovery. The organizations listed here are among the leaders campaigning to save caribou along with many First Nations. Visit their websites, inform yourself and please get involved. Thank you. This website is supported by funding from the Harmony Foundation, The Calgary Foundation and Alberta Wilderness Association.